Researchers at Colorado State University (CSU) have developed an approximate dynamic programming approach to improve the food security of communities affected by natural disasters. Their work exploring methods to aid community recovery spans several papers. Their most recent paper, pre-published on arXiv, focuses on building portfolio restoration, one of the most challenging aspects of community recovery. "Resilience-related research during the past decade has led to recommendations of metrics to describe acceptable performance of independent and interdependent civil infrastructure systems following extreme natural hazards," Saeed Nozhati, one of the researchers who carried out the study, told TechXplore. "These metrics have been developed for different systems, such as electrical power and water networks and transportation systems. However, there has been very little effort that connects disruption in civil infrastructure to failures in food distribution, despite the fact that food security depends on these critical infrastructure systems, identified in Presidential Policy Directive 21." The recent study carried out by the researchers at CSU explores the connection between failures in food distribution and disruptions in civil infrastructure. After natural disasters, household food security problems tend to worsen considerably. For instance, back in 2015, hurricanes Rita, Wilma and Katrina resulted in disaster-related food programs that distributed $928 million in benefits to 2.4 million households. "For the purpose of our research, we focus on three dimensions that are particularly germane and relevant for the nexus between infrastructure performance and household food security in terms of food accessibility, availability and affordability," Prof. Bruce Ellingwood, one of the researchers who carried out the study, told TechXplore. 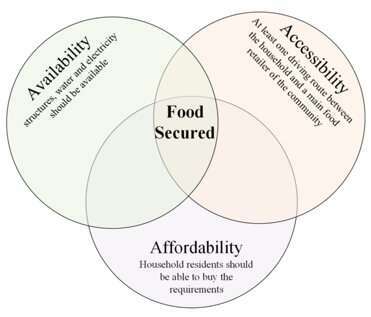 In the context of food security, affordability captures the ability of households to purchase food from retailers. Accessibility, on the other hand, refers to whether a household has physical access to food retail outlets, which often depends on the state of transportation networks. Lastly, availability is concerned with the functionality of the food distribution infrastructure, including wholesalers, retailers and ultimately consumers. "Several studies have addressed the issue of maintaining a resilient food distribution system prior to disasters, but a dearth of work on the optimal recovery of the food distribution system post-hazard was the primary motivation for us in addressing this challenging problem," Prof. Edwin Chong, one of the researchers who carried out the study, told TechXplore. In their previous work, the researchers explored several ideas, considering the functionality of energy, water and food retailers. Nonetheless, they found that the problem of restoring the building portfolio within a community was somewhat elusive, due to the scale of the problem in terms of computation. Thus, in their recent study, they decided to focus on building portfolio restoration, which is an essential element of availability and plays a major role in addressing food security issues. Number of people with inhabitable houses a) following the earthquake b) after 100 days c) after 600 days. Credit: Nozhati et al. The researchers introduced a stochastic scheduling algorithm to identify optimal building portfolio recovery strategies. Their approach provides a computationally tractable formulation that can manage multi-state and large-scale infrastructure systems. "After a natural hazard occurs, the damage to the building portfolio of the city is computed using several models," Saeed explained. "Based on these models, we utilize the repair times associated with the damage levels to schedule the assignment of resources optimally, so that our objective of food security, defined as maximum number of inhabitants of the community that have safe household unit structures per unit of time, is met." To circumvent the computational difficulties associated with optimally assigning resources, the researchers proposed a non-preemptive scheduling framework, in which resources are not reassigned to repair buildings within the community until the repair works at the currently assigned building site are completed. "This is ideal when the decision maker deals with non-central stakeholders and private owners, which is the case for a typical community building portfolio," Prof. Chong said. "In contrast to previous studies on this topic, we show the efficiency of our approach on a real community affected by a severe earthquake. Food-insecure and vulnerable groups within the community, including children and senior citizens, must receive more attention during recovery. We demonstrate how to identify vulnerable areas and segments of the population." The CSU-based researchers used a test bed community modeled after the city of Gilroy, California, to illustrate how their approach could inform decisions related to building recovery after a severe earthquake. In this instance, their stochastic dynamic optimization approach successfully planned a near-optimal building portfolio recovery. "Because our approach is easily scalable to different communities, and adaptable to other infrastructure systems and hazards, we anticipate that our technique will have a meaningful impact on post-disaster planning in the near-future," Yugandhar Sarkale, one of the researchers who carried out the study, told TechXplore. "Our framework also supports risk-informed community decision makers during chaotic post-hazard circumstances." The research carried out by Nozhati, Sarkale, Prof. Ellingwood, Prof. Chong and their colleague Hussam Mahmoud, presents a risk-informed framework for evaluating issues associated with food-security after severe natural hazards. By defining food security metrics based on food availability, accessibility and affordability probabilistically, either at a parcel or community level, their approach could ultimately guide public planning and decision-making after natural disasters. "Our objective in this study was restoration of the community building portfolio, which is a major factor in maintaining community food security," Prof. Ellingwood said. "In future work, we will incorporate other aspects that we know are important for food security, extending our models from physical infrastructure systems to social and economic systems, along with their interdependencies, to better address the three dimensions of food security identified above." Can the redistribution of surplus food really improve food security?